Brilliant medium dark ruby color. 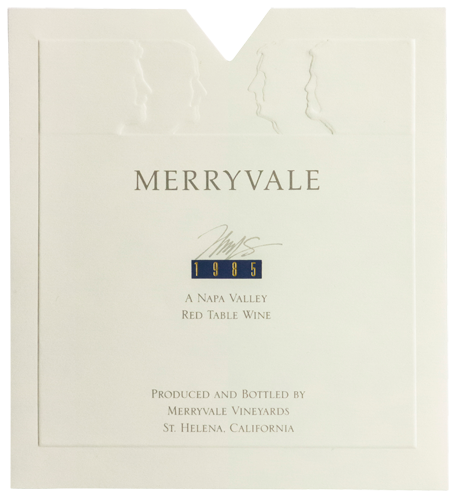 Hints of coffee and spice hide behind more pronounced aromas of black cherry and blackberry. After some airing in the glass, the briary undertones are augmented by notes of mint and vanilla. Upon tasting, the wine exhibits a full velvety mouth feel with supple tannins and a round, elegant finish with lingering berry-brambly flavors. In all, a very complex wine, and perhaps our best effort yet from outstanding vineyards in an outstanding year. 9.7 tons Cabernet Sauvignon: Spottswoode Vinyard, St. Helena, Harvested 9/26/85, Brix at harvest 23. 6.2 tons Cabernet Sauvignon: Ken Laird Vineyard, Yountville, Harvested 10/4/85, Brix at harvest 23.5. 7.9 tons Merlot: Winery Lake Vineyard, Los Carneros, Harvested 9/26/85, Brix at harvest 23.2. 6 tons Cabernet Franc: Frediani Vineyard, Calistoga, Harvested 9/16/85, Brix at harvest 22.7.